Xiaomi launched a new and improved Redmi Note 5 Pro with A.I. in China! 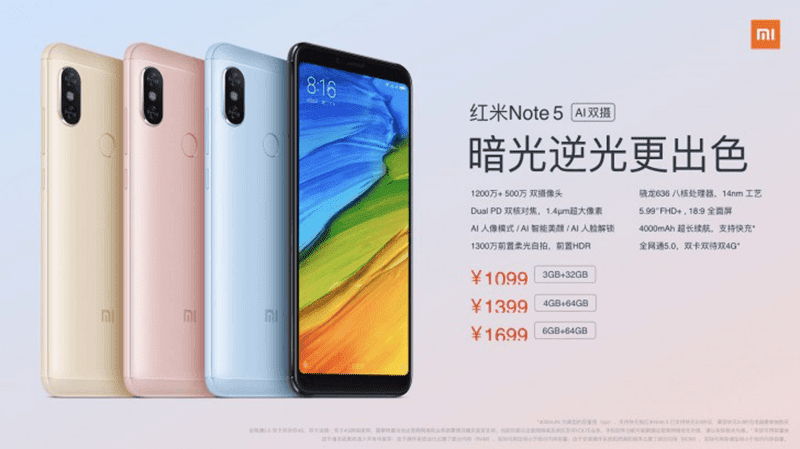 Home / mobile / news / xiaomi / Xiaomi launched a new and improved Redmi Note 5 Pro with A.I. in China! In China, Xiaomi launched an updated version of the Redmi Note 5 Pro compared with the Indian variant. The new Redmi Note 5 Pro still has the same 5.99-inch FHD+ 18:9 screen, but now has better cameras, USB Type-C connection (instead of micro USB), and A.I. In particular, Xiaomi replaced the 12MP f/2.2 lens of the Indian Redmi Note 5 Pro to the brighter f/1.9 lens. Xiaomi also added a Dual Pixel PDAF focus system for faster and more accurate focus. For selfies, the 20MP selfie camera of the Indian variant has been replaced with a 13MP sensor. But, it is now A.I. powered. It now has portrait mode, beauty mode, and face unlock improved the power of artificial intelligence. The new Redmi Note 5 Pro also has the speedier Qualcom Quick Charge 3.0 (instead of 2.0) and Android 8.0 Oreo out of the box with Project Treble (instead of Android 7.1.1 Nougat OS). The new Redmi Note 5 Pro will be available in black, blue, gold, and rose gold color options. Price starts at RMB 1,099 (around PHP 9K).